Japan Rail Pass or Regional Pass? One of the questions we get asked most is: Which Japan Rail Pass should I get? A regional pass or a nationwide JR Pass? With over 30 regional passes on sale, it can be confusing for even the most experienced traveller to find a match. Here’s our expert guide to help you find the best fit for your travel plans. First though, check if the national Japan Rail Pass is the best option for your travels. Here’s why: just have a look at the map below broken down by JR company. The national rail network is managed by 6 JR companies. If you want to travel to multiple regions then the Japan Rail Pass will be the best choice. On the other hand, a regional pass will make sense if you only travel within 1 or 2 connecting area’s. Example 1: The most popular trip for a quick visit to Japan is often Tokyo, Kyoto and Osaka. These are 3 regions apart (JR East, JR Central and JR West) additionally, no regional pass covers the Tokaido Shinkansen between Tokyo – Kyoto and Osaka. Thus a 7 day JR Pass would be the best option. 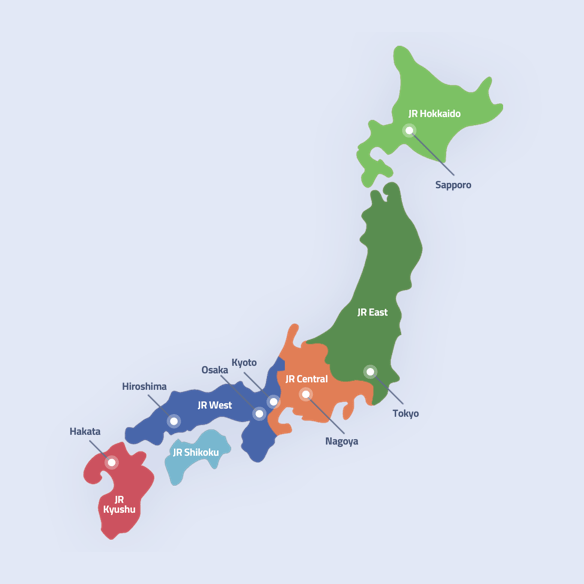 This because it covers all of Japan, including all the Shinkansen lines. Example 2: Got a bit more time in Japan? Then you may want to see more places like: Himeji, Hiroshima or even Nagasaki? Then you’ll be visiting even more regions and a 14 day JR Pass will be your one ticket to see them all. In short: the Japan Rail Pass is nearly always the best choice when visiting multiple regions. Example 3: You arrive at Kansai Airport (KIX) and plan to visit Kyoto, Osaka, Kobe with a day trip to Himeji. All these places are within the Kansai Area and a regional pass for Kansai will be a great match. When do you use a regional pass? To start with, when visiting a particular region in Japan. Like the Japan Rail Pass, these passes can help you save a ton of money on rail tickets. There are three types of regional passes. We’ll break these down per category and feature the most useful. 1.) That are valid for one area in Japan, for example the Hokkaido Rail Pass. 2.) Regional passes that are valid for only a part of the region. For example the JR Kansai Pass. Valid of the Kansai area, which is part of the JR West area. 3.) Regional passes that are valid in linked area’s, for instance the JR East – South Hokkaido Rail Pass. This pass makes sense when you want to travel between Tokyo and Sapporo. Valid for all JR Lines in Hokkaido, available for 3, 5 or 7 days. There’s also an option for 4 flexible days within a 10 day period. This is a cost effective option if you’re exploring Hokkaido. Valid for all JR lines within Shikoku. Available for 2,3, 4 and 5 days. Easy choice when you go hopping around Shikoku. Valid for all JR lines within Kyushu, including the Kyushu Shinkansen. Available for 3 or 5 days and provides excellent value for money. The second category of regional passes are those that cover only part of a region. Valid for the Kansai Area, available for 1,2,3 and 4 days. This is a cost effective option when visiting multiple cities within the Kansai Area. Including, Himeji, Kyoto, Osaka, Kobe and Wakayama. JR Kansai Wide Pass. Valid for the greater Kansai area and valid for 5 days. This pass is especially good for making day trips when you are based in the Kansai Area for places like Okayama, Kinosaki-Onsen and Takamatsu. JR Kansai – Hiroshima pass. Basically the JR Kansai Wide Pass with travel to Hiroshima. The pass provides excellent value if you stay in Kansai and want to visit Hiroshima (or the other way around). This pass is a good option for exploring the Tateyama Kurobe Alpine route. In covers the whole alpine route, as well as transport to and from the Alpine route from Takayama and Matsumoto. The third category are passes linking different JR regions. Covering travel between Tokyo and Sapporo, valid for 6 days within a 2 week period. This pass offers the most economic option to make the return Tokyo – Sapporo with different options for side trips. You can ride the fastest train in Japan up to Hakodate, the Hayabusa Shinkansen. This pass is special in that it is the only regional pass that connects Tokyo – Kyoto and Osaka and at a lower price tag than a 7 day JR Pass. You travel via the “Hokuriku Arch” following the northern route via the cities of Nagano and Kanazawa, both worthwhile stops. This is significantly slower than the Tokaido Shinkansen between Tokyo – Kyoto but nevertheless a good option for those who want to save on travel costs, not to forget that the pass is a great excuse to visit Kanazawa especially. This pass is a bit of a hidden gem, linking Fukuoka (Hakata station) to Kansai and covering both the north of Kyushu and JR West area, covering cities like Kyoto, Osaka, Okayama, Hiroshima and Himeji. Hope you found this guide useful, if you have questions regarding a pass or want to know what would suit your plan best, get in touch on our forums. Which lines does the JRPASS cover? Why is 1st class called Green class on Japanese trains?